FLIR i-Series thermal imaging cameras are ideal for users that are just iscovering the benefits that thermal imaging has to offer. Extremely easy-to-use, they will help you to do your first thermal inspections. FLIR i7 is the smallest, lightest and most affordable thermal imaging cameras on the market. They are incredibly easy to use and require no former experience. It really is a matter of "point and shoot" to obtain high-quality thermal images that will immediately give you the thermal information you need. The fixed focus free lens makes using the FLIR i3/i5/i7 a snap. FLIR i-Series thermal imaging cameras withstand a 2 meter drop. Watersplash proof with an IP43 rate. 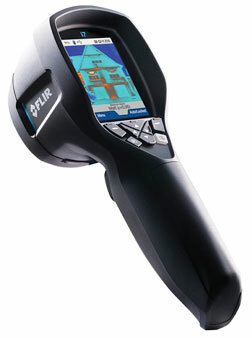 FLIR Tools software is included and the camera are also compatible with the more powerful FLIR Reporter. Measures temperatures up to +250°C and detects temperature differences as small as 0.10°C (0.15°C for FLIR i3).